High School students from Ramaz Upper school in New York City joined in a team effort to creatively design Stars of HOPE® with Hebrew expressions of cheer for the Reuth Hospital in Israel. Sophomore Jacob Bengualid spoke about the many diverse rehabilitative services that Reuth’s remarkable medical facilities provide, from infants to seniors. Reuth is the hospital where the most serious cases go for treatment. 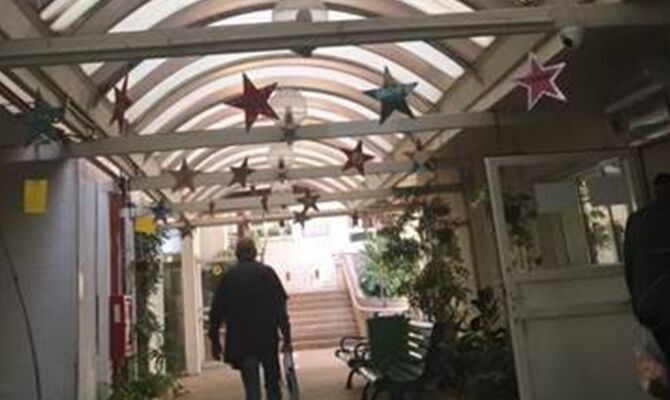 The Stars of HOPE are now being displayed in the entrance of the hospital, up high like Stars in the sky. For all to have hope as they walk into the hospital. “The nursing team was so inspired by the stars that they decided to make it a permanent exhibition of their hallway.” -Beth Bengualid Kol Hakavod!